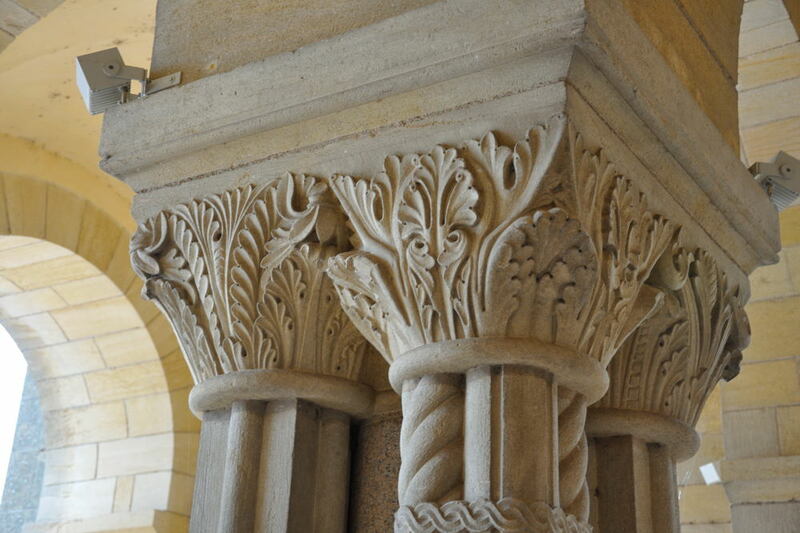 A Glossary of Romanesque Architecture. 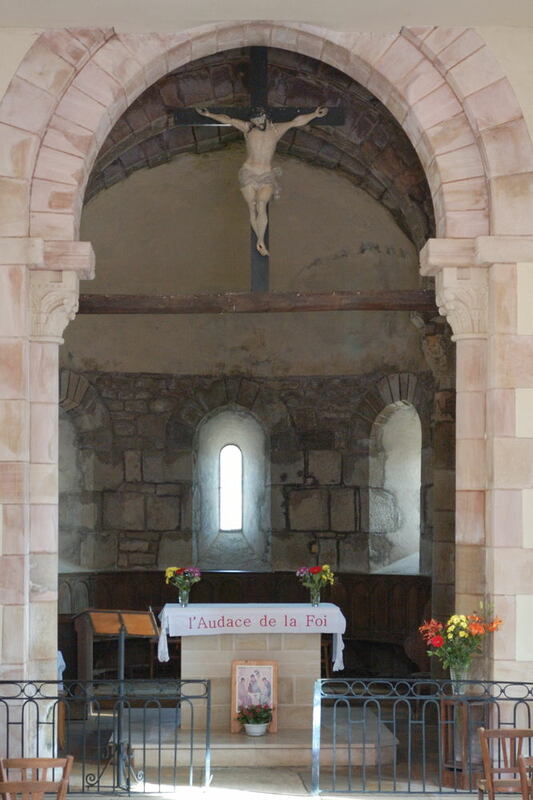 During my search for Romanesque churches in the part of Burgundy (Saône-et-Loire 71) I live in, the site "le site sur l'Art Roman en Bourgogne" with an inventory of most (if not all) Romanesque churches in Burgundy has been very useful. 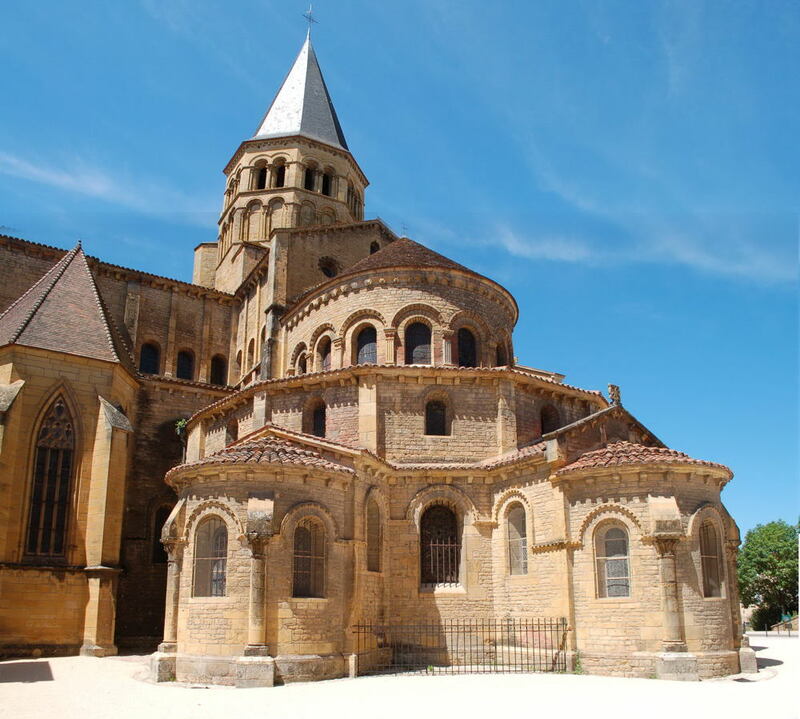 Besides, this site (in French) offers a very useful glossary of terms used in Romanesque architecture. 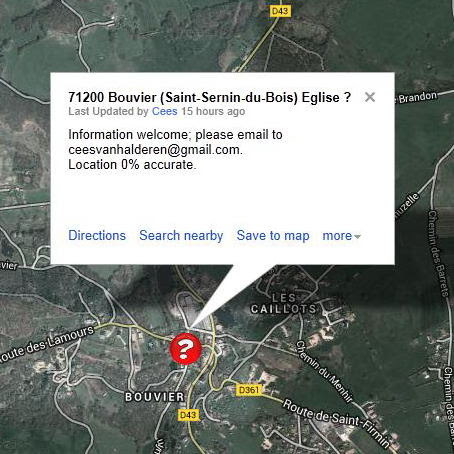 This glossary, written by webmaster Mr. Eduard van Boxtel, contains lots of references to terms one finds in French books on the subject or guide books of the area, in brochures or on the information panels often placed outside churches. His glossary has the advantage (which sometimes turns into a disadvantage) that it Is written in French. The advantage is clear: brochures and panels are often written In French as well; hence looking up words can be done on a one to one basis. The disadvantage however is, that if the description is a bit vague, or the reader is not very well versed in French, the reader remains with as many question marks as before he started looking up a word. Apart from that, there are also interesting books or guide books available in English, and in many cases the link between a French term and the corresponding English word is not always very clear. 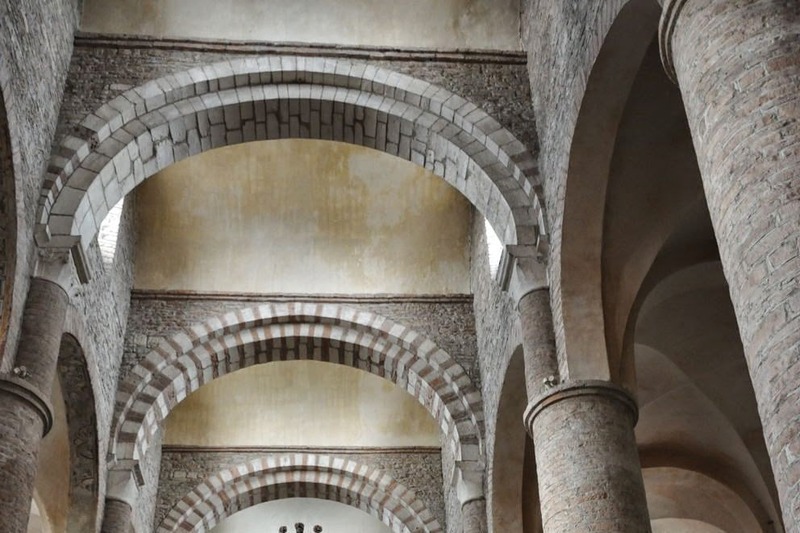 A very simple example : Romanesque architecture is in England often referred to as Norman architecture, even though Norman architecture can be seen as a "sub" style of Romanesque architecture; the architectural style used by builders who had their roots originally in Normandy. Another example : "Bande lombarde" in the French Wikipedia becomes "Lombard band" in its English counterpart. So far, so good. Mr. van Boxtel's glossary gives the following explanation: "Bandes de faible saillie verticale ou lésènes reliées par de petits arcs". One would think that in such a case one picture says more than a thousand words. Arc en mitre (mitre shaped arch ©), whereby © stands for my first name. References to other entries within an entry are indicated in bold italic. 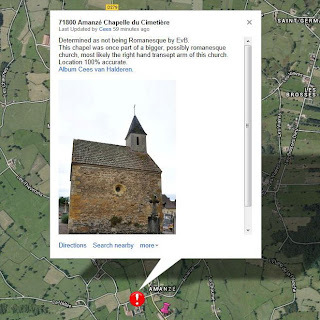 These are short instructions for use of the interactive maps of Romanesque churches in Burgundy. . 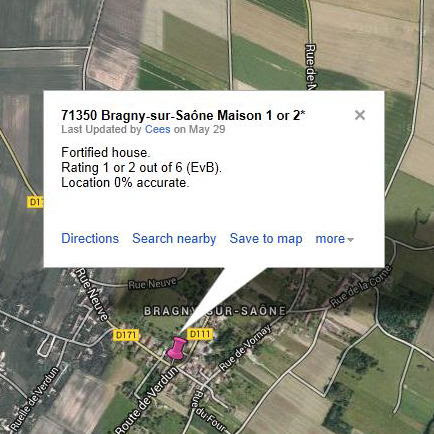 This description is entirely based on the interactive map for the department Saône-et-Loire (71), but is als valid for the remaining 3 departments (21, 58 and 89). 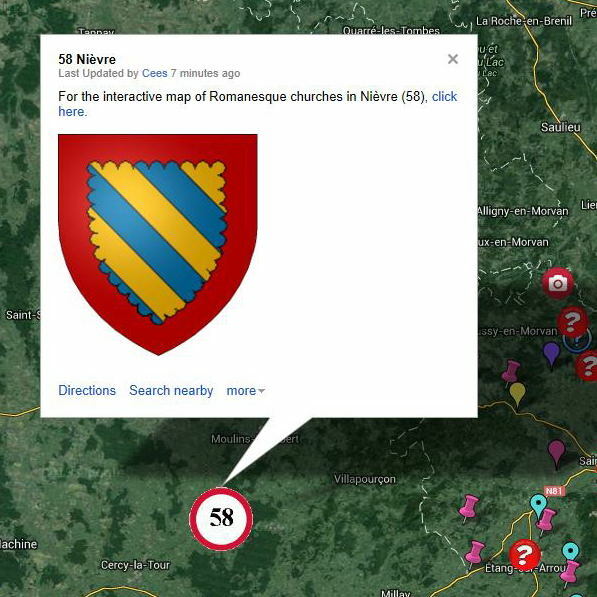 This map is entirely based on a web page , further referred to as EvB, where (almost) all Romanesque churches in Département Saône-et-Loire (71) are inventoried. Only a few churches outside this department are included, basically because they are just outside 71 and because they are normally included in travel guides for this department, e.g. Charlieu -42-, Neuilly-en-Donjon -03-. The lefthand side menu contains a number of symbols. 1a. The first symbol, the red house, points to our house, the basis for our tours in search of Romanesque churches in the area. 1b and 1c. 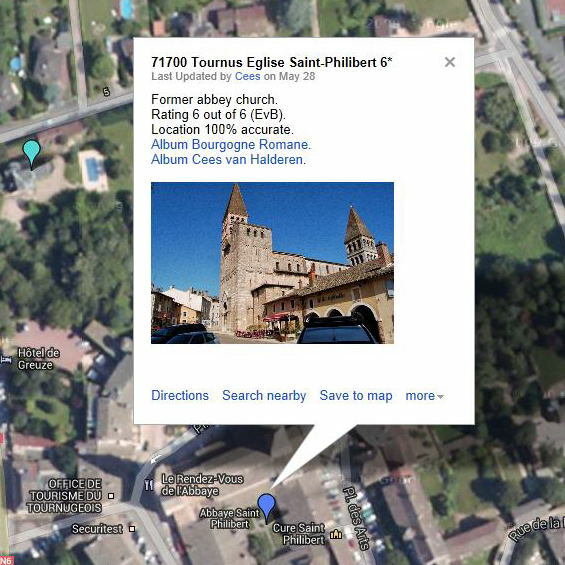 The information symbol i points to general, not necessarily building or edifice related information. Link to the "instructions for use (71)"
Symbol 1b : the information symbol i . This particlar i gives a link to the "instructions for use" of this map. Symbol 1c : the information symbol i . 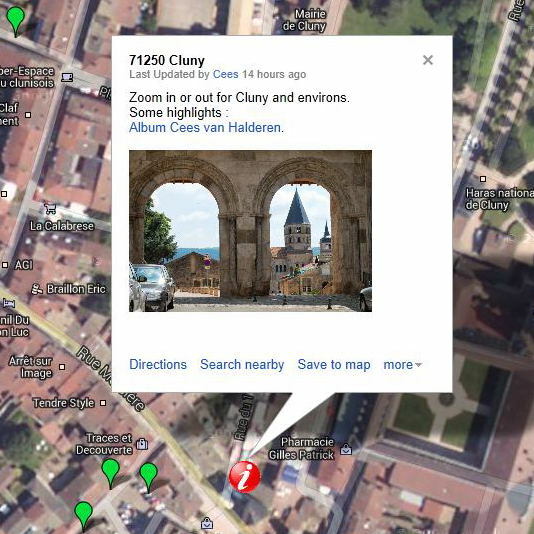 This particlar i points to major places of interest, enabling the user to "jump" straight to a specific town or area (Cluny, Tournus, Brionnais, etc.). 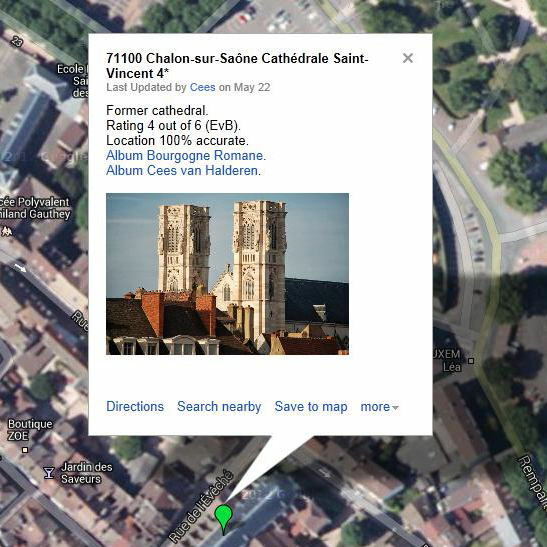 From there it is easy to zoom in or out to find edifices in or around the area itself. 1d. Symbols in the shape of various pointers. The remaing symbols are pointers, in various shapes : upside down drops (called drops) in various colours, with or without en eye in the middle, drawing pins in matching colours, blue question marks and purple cameras. The colours of drops and drawing pins are all related to the rating of the buildings. The matrix below shows how the various edifices are indicated. The colours of the markers follow the rating of Eduard van Boxtel's website (EvB). The dark-blue markers on the lefthandside are used for edifices wit a rating of "6" on a scale of 6, hence for buildings of extraordinary architectural interest (e.g. 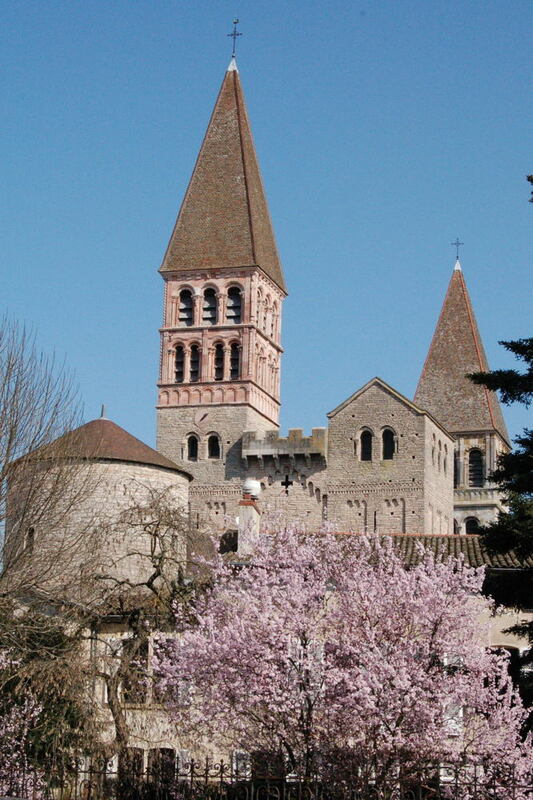 Cluny, Tournus). To the right the importance diminishes from "5" (red) down to "1" (dark-violet), where the latter is a building with very few romanesque features (e.g. a window opening, a baptismal font). The column on the utmost righthandside (purple pointers) indicates that EvB so far has had insufficient information to properly rank the building; they are indicated as ranking "1 or 2". The top row (drops with a black eye in the middle) indicates that there are pictures available on the internet. The description of the buildings gives a link to EvB's site only. The rating of those drops runs from "6" down to "2". As soon as as I have my own pictures available, the drop will be replaced by one without a black eye in the middle. In principle the amount of drops with a black eye in the middle should decrease. The middle row (drops without a black eye in the middle) indicates that there are pictures available on the internet. The description of the buildings gives a link to a Picasa Album of myself, Cees van Halderen (CvH) as well as (sometimes, not always) to a page of EvB's site. The rating of those drops runs from "6" down to "1" and to catagory "1 or 2" (undetermined). In principle the amount of drops without a black eye in the middle should increase. 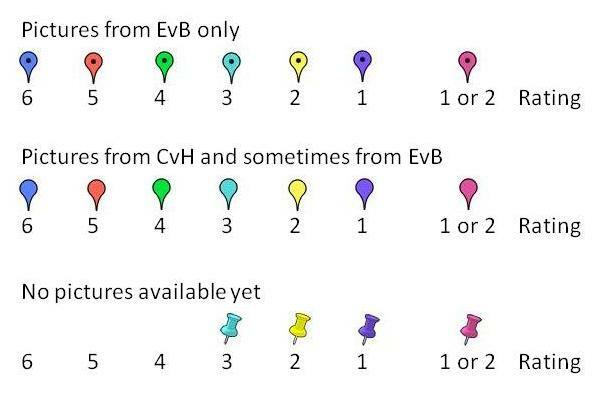 The bottom row (drawing pins) indicates that there are not yet pictures available on the internet (at least not from EvB or CvH). The rating of those drawing pins falls in the catagories of "3", "2", "1" and "1 or 2". In principle the amount of drawing pins should decrease. Place or hamlet name. Place names or hamlet names in the side menu are ordered alphabetically, with in case of hamlets the name of the commune between brackets behind the hamlet's name. Rating in stars on scale ranging from 6 to 1 (EvB). Some particulars about the edifice, if available. The century the building was erected. 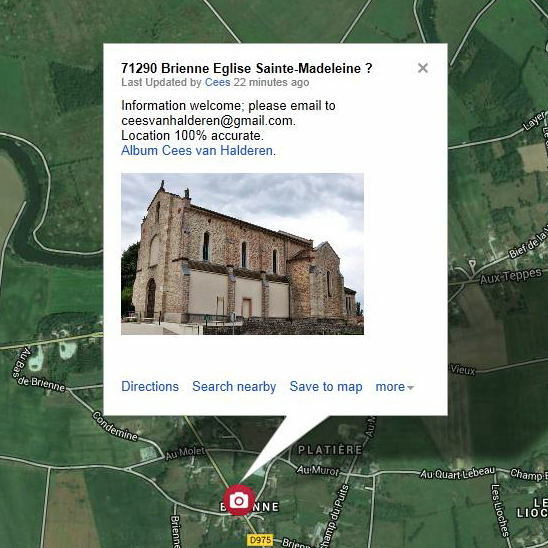 Accuracy of the location on the map. 100% spot on, 90 to 50% reasonable, 0% unknown. A link to one or more picture albums. 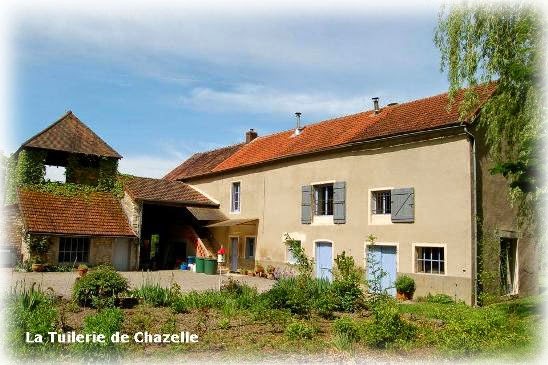 Bourgogne Romane (EvB): gives a short description of the edifice and photographs. Cees van Halderen (CvH): gives only, but usually more photographs. Sometimes there is a link to both albums, sometimes to one of either albums. Some examples of the various entries are given below. Needless to say, that these are only examples; a drop with a black eye in the middle or a drawing pin could in the meantime have been replaced by a drop without a black eye in the middle. Building rated "6" out of 6 based on EvB's scale. Building rated "2" out of 6 based on EvB's scale. Building rated "1 or 2" out of 6 based on EvB's scale. Edifice of which neither EvB nor I have yet photographs or detailed information available. Building which has no rating (red question mark). Edifice of which it is not even sure whether it is romanesque at all. neither EvB nor I have yet photographs or detailed information available. Building which has no rating (red camera). 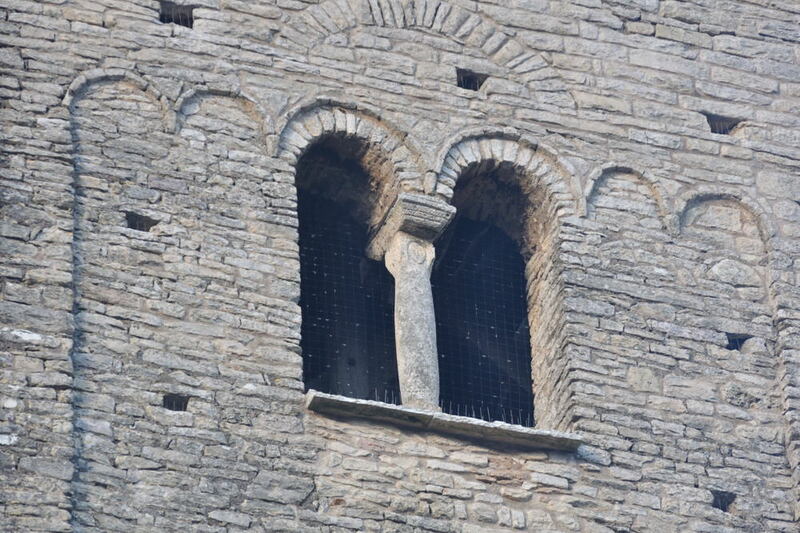 Although I have some photographs available, they are insufficient to qualify the building as romanesque. People who might be able to clarify this are requested to contact me via email. A building of which it became clear that it has no Romanesque featues (red exclamation mark). There are only pictures available on the internet taken by CvH. 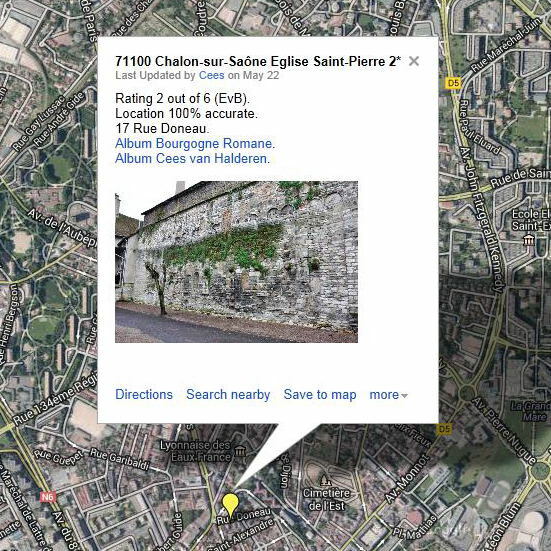 The edifice is still shown on this map because there is either still a link between this building and another (often demolished) Romanesque building, or because the building is worth visiting despite it not being Romanesque. There are however very few buildings marked thus; at this moment there are only two. 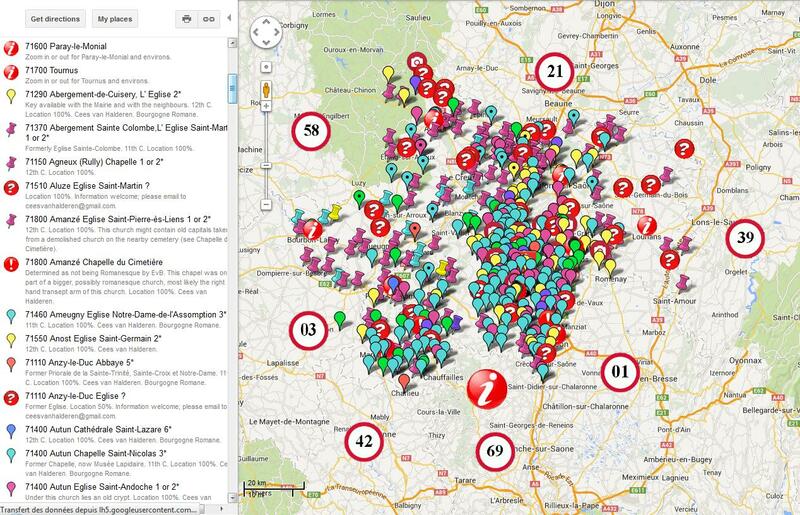 Finally the map shows a number of "speed limit signs". the figures on display are however not speed limits, but department numbers. The signs with the numbers 21 (Côte-d'Or), 58 (Nièvre) and 89 (Yonne) contain a link to the map of the relevant department; they are almost as complete as the one for department 71. Because romanesque architecture in Burgunduy does not stop abruptly at the present border of this region, the bordering departments (e.g. 01, 03, 10, etc.) are indicateed with their own "speed limit sign". For most of these departments van Boxtel has made a (limited, arbitrary) choice from the romanesque churches in in a belt of roughly 25 km around Burgundy. N.B. : the partial maps of the boundering departments 01, 03, 10, 18, 39, 42, 45, 52, 69 and 77 are incomplete and onnly give an impression of the area around Burgundy. Needless to say that this map does not pretend to be complete. It is virtually impossible to keep two separate sites, i.e. 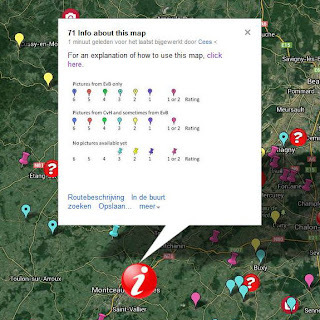 this map and van Boxtel's site completely in line with each other. 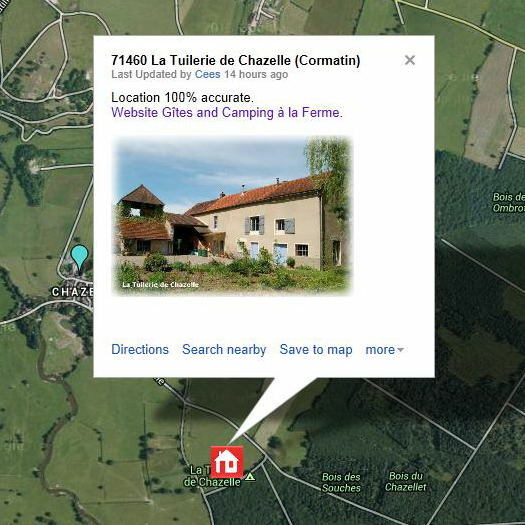 When the latter adds a photo page to his site this will not automatically mean that this map will be updated as well. However, I think that this map is very usefull for those who would like to find out which churches can be found in a certain area. The abacus on this photo is the square or rectangular stone slab between the chapiteaux (capitals) and the beginning of the arcs (arches) resting on the colonnes (columns). See also tailloir (synonym) en architrave. A church belonging to an abbaye (abbey); on the photo the abbatiale Saint-Philibert in Tournus. An abbey is a monastère (monastery) for monks or nuns of a contemplative monastic order (e.g. the bénédictins, the Order of Saint-Benedict). Within the walls of an abbey one would find the abbatiale (abbey church), sleeping and eating facilities, library, a vegetable garden, etc. 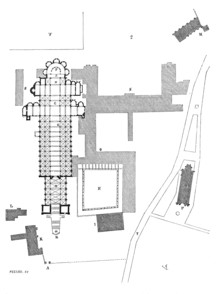 The plan (Wikipedia) is that of the Benedictine abbey in Cluny according to Viollet-le-Duc. Although this abbey has been demolished it has had a major influence on roman (Romanesque) architecture. The head of an abbaye (abbey) for monks. Cluny has seen some great abbots in its time, of which some were canonized. 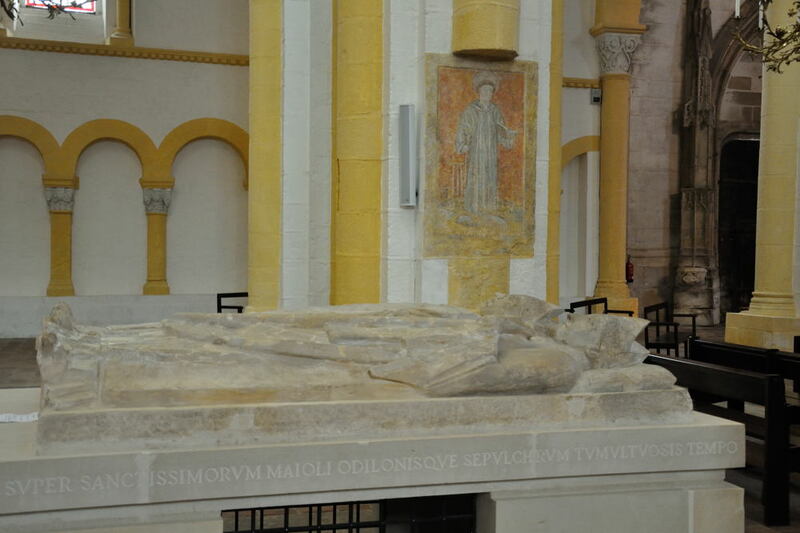 In the picture the grave of Saint-Mayeul and Saint-Odilon, both abbots of Cluny in the 10th and 11th century. 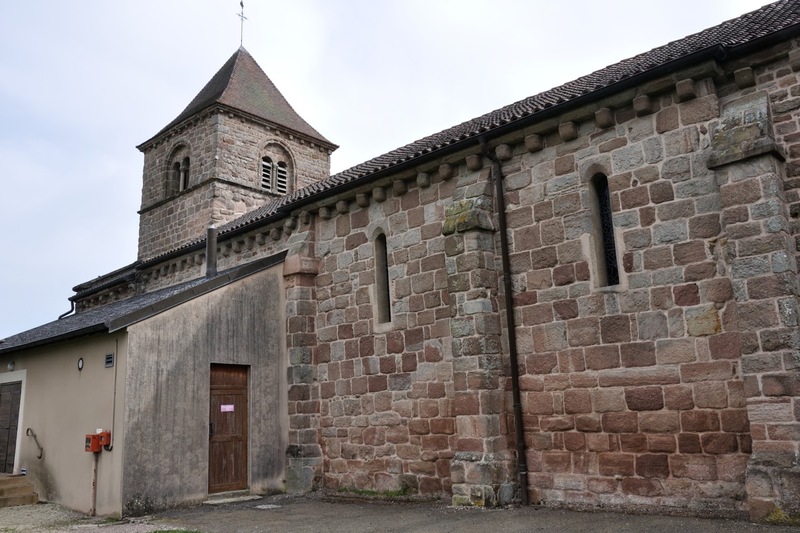 The grave is located in the former clunisien (Cluniac) priorale (priory church) in Souvigny (03). The head of an abbaye (abbey) for moniales (nuns). This picture (Wikipedia) comes originally from a 19th century Swedish encyclopedia. 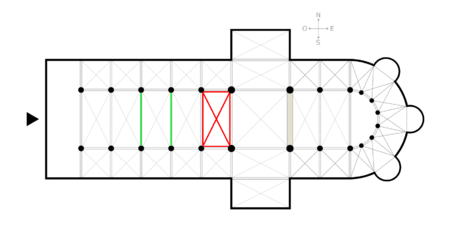 This is the part of the church that closes off the chœur (choir); in plan (Wikipedia) the abside is indicated in grey. The plan of an apse is often semicircular, sometimes polygonal. On the photo the abside of the Saint-Gervais-et-Saint-Protais in Bourg-le-Comte. 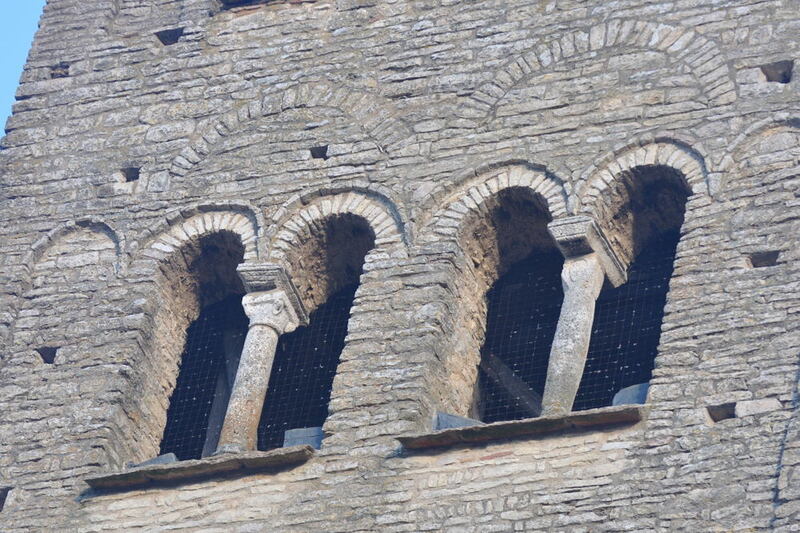 This apse is decorated with bandes lombardes (Lombard bands). The translation in the title is followed by this sign ©; this means that it has been "invented" by me. 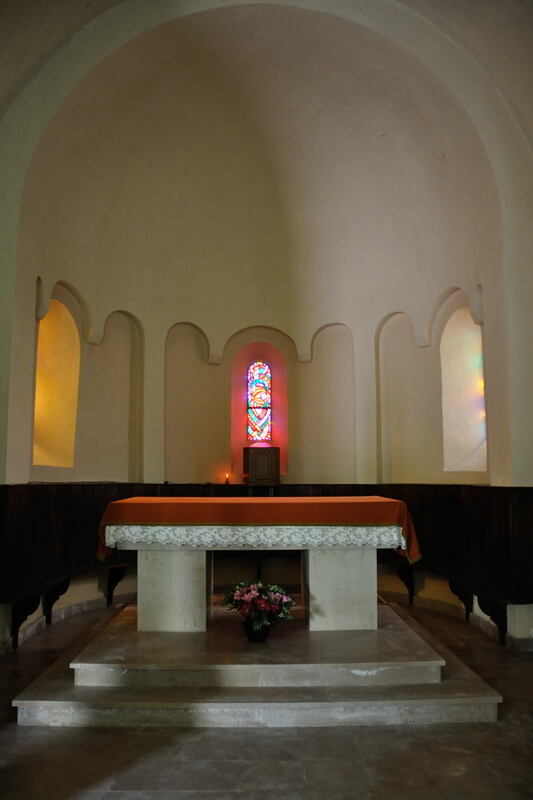 A semicircular chapelle (chapel), often attached to the chœur (choir) or the déambulatoire (ambulatory), sometimes built against the transept. 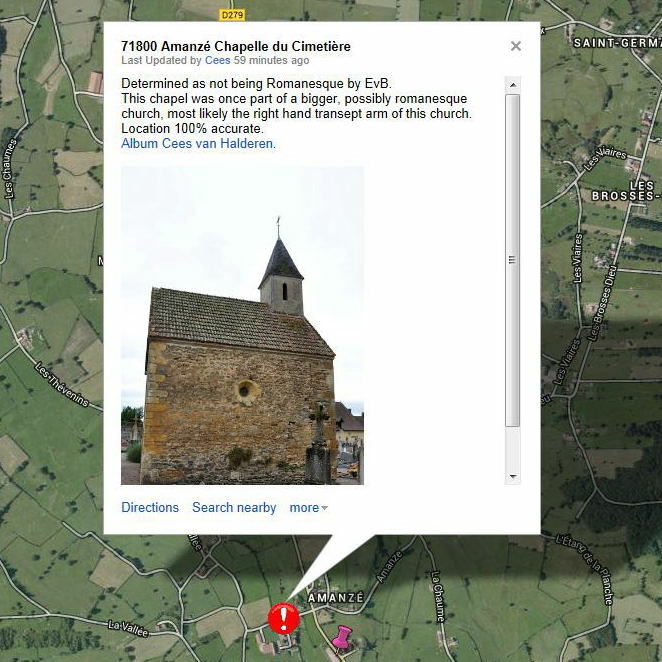 In plan (Wikipedia) the 3 chapels built against the déambulatoire are indicated in grey. 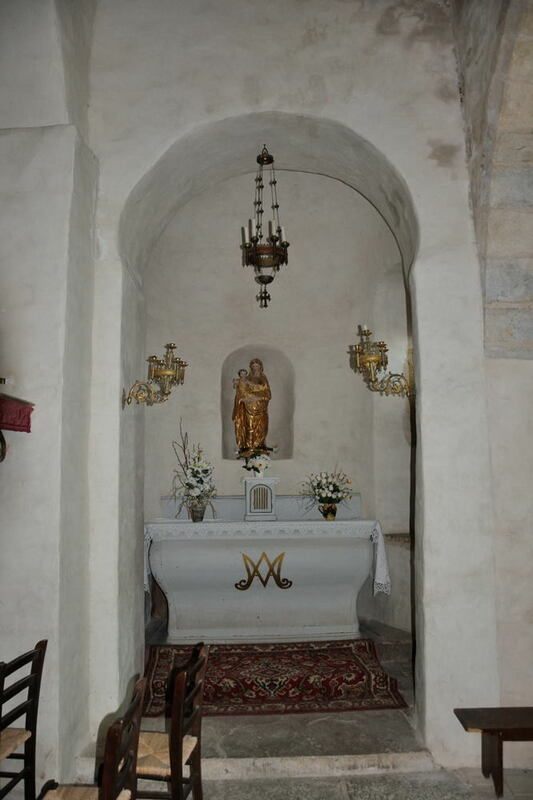 These particular chapels are also called chapelles rayonnantes (apse chapels). The bigger the church, the more apse chapels can be attached. On the photograph the apse chapels of the Sacré-Cœur in Paray-le-Monial. See arcature; ajouré is used as opposed to aveugle (blind). These claustras (ajoure tiles) can be found in the wall of a chapelle (chapel) of the Saint-Philibert in Tournus. The way stones, or bricks, are put together in a wall. 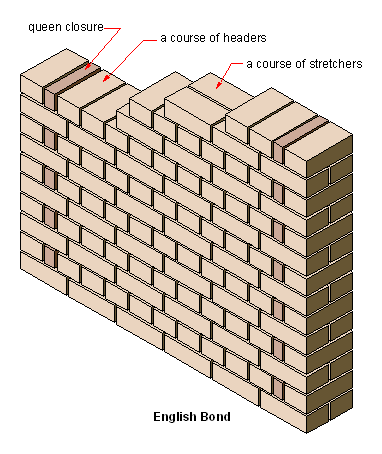 According to the visible pattern after brick laying, which in itself depends on how the various assises (layers or courses) are assembled, the bond will have a name like Flemish bond, English bond, etc. 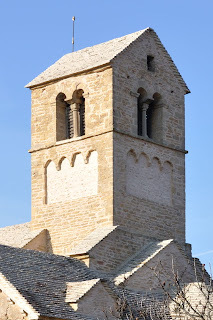 In roman (Romanesque) architecture one distinguishes petit, moyen and grand appareil, q.v. There are more subjects related to appareil. The stones are assembled in a regular pattern, and the assises (courses) will have a height of approx. 12 inch or more. The nef (nave) of the Saint-Symphorien in Sanvignes-les-Mines is made in grand appareil. See also grand appareil (synonym). The small stones (max. 8 inches high) are assembled in a more or less random, irregular pattern. 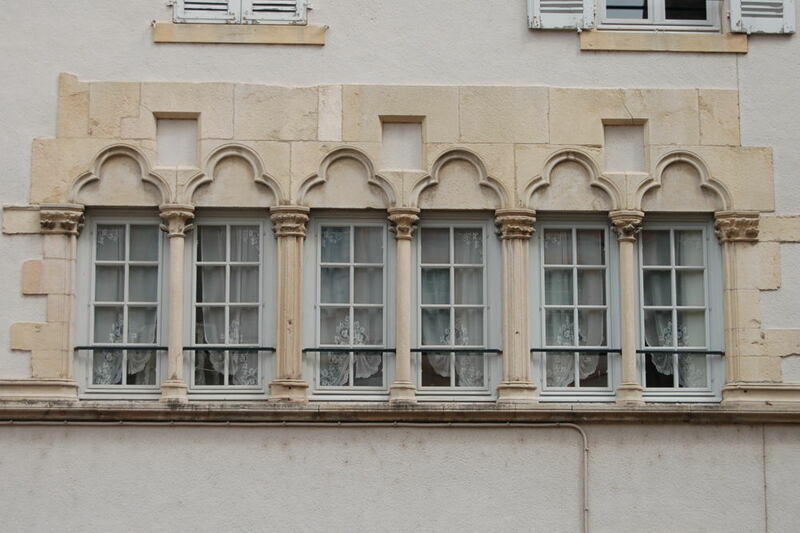 The rather haphazardly spaced stones around the window are placed in petit appareil irrégulier. See also petit appareil irrégulier (synonym). The stones are assembled in a regular pattern, and the assises (courses) will have equal heights of between approx. 8 and 12 inches. This bond has been used in the walls of the chapelle (chapel) de Coureau in Bray. See also moyen appareil (synonym). The stones are assembled in a regular pattern, and the assises (courses) will have a height of max. 8 inch. The clocher (bell tower) in the picture is made in petit appareil régulier. See also petit appareil régulier (synonym). In architecture arches appear in many shapes, ranging from a simple round arch to the more complicated multi-foil arch. This blog contains an overview of the various arch types, all entries start with arch. The description of the numbers 3, 4, 6 and 7 has been made up by me, based on the Dutch original. This is an arc (arch) consisting of two rows of stones placed above each other. 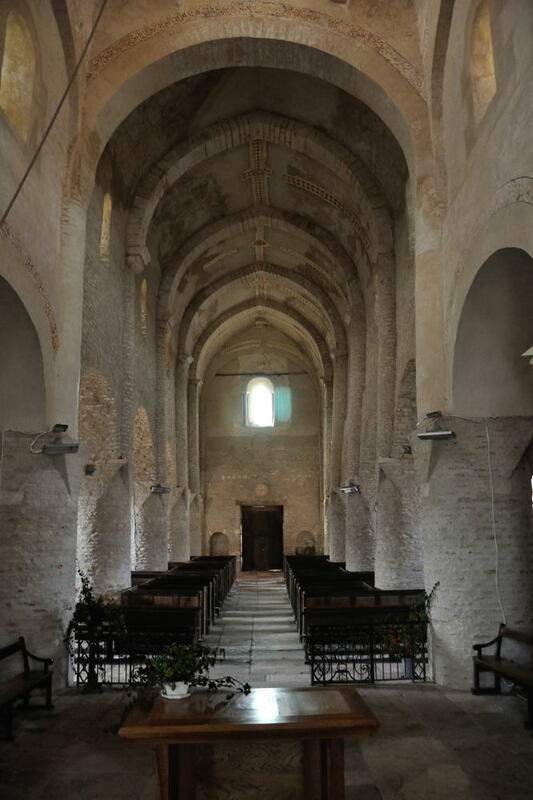 In the photograph the nef (nave) of the Saint-Philibert in Tournus. See also double rouleau (synonym). 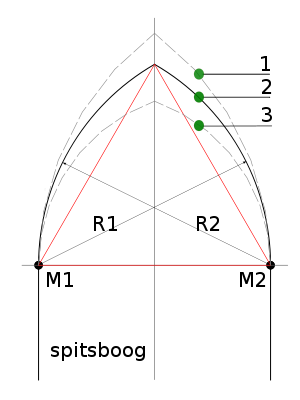 In case of a lancet arch the centre of one arc lies outside the opposite arc. The equilateral pointed arch is an arc (arch) based on an equilateral triangle; the centres of the arcs with radii R1 and R2 are M1 and M2. 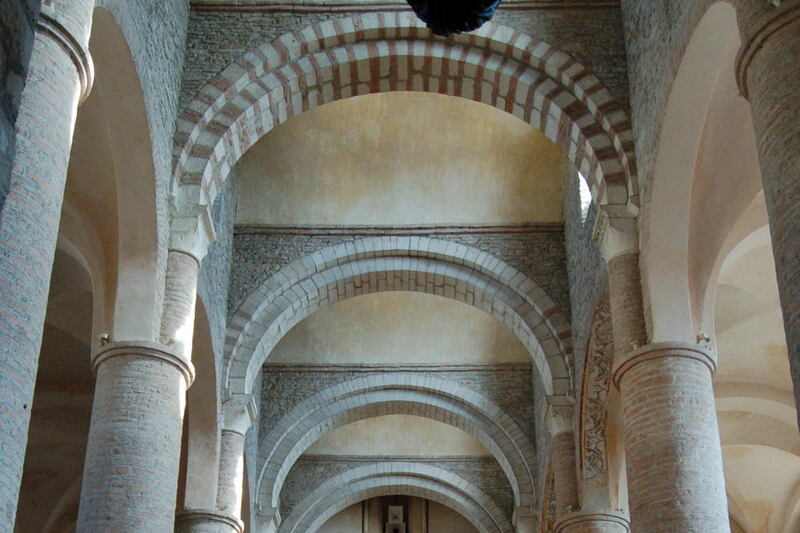 The picture shows a row of pointed arcs (arches) in the nef (nave) of the Saint-Pierre in Brancion (Martailly-lès-Brancion). See also arc ogival (synonym), lancette, tiers-point, ogive, voûte d'ogives and croisée d'ogives. The discharge arches in the picture are the top two arcs (arches), embedded in the wall itself. Normally these arches take some load off a linteau (lintel); in this case however they take some load of the colonne (column) in the middle of the baie (wall opening). This is a transverse wall-bearing arc (arch) forming a partial wall, dividing a voûte (vault) or a plafond (ceiling) into compartments. 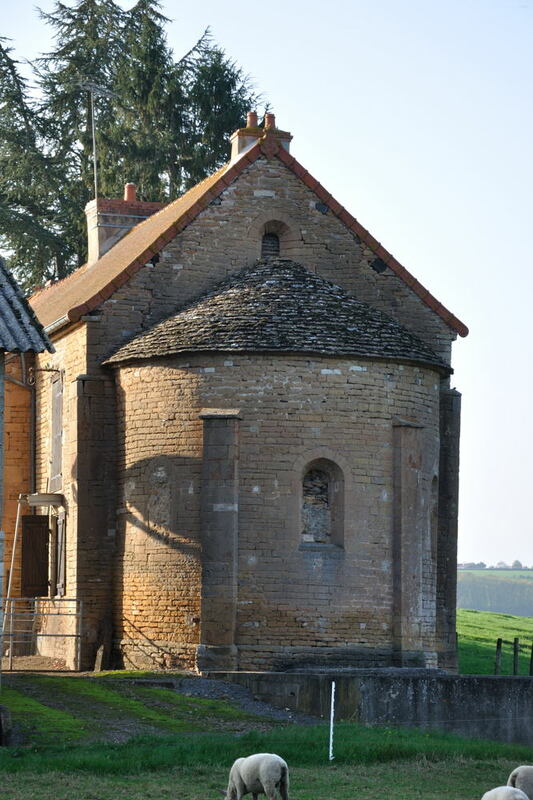 The picture (from internet) shows an arc diaphragme in an oratoir carolingien in Germigny-des-Prés (Loiret 45). 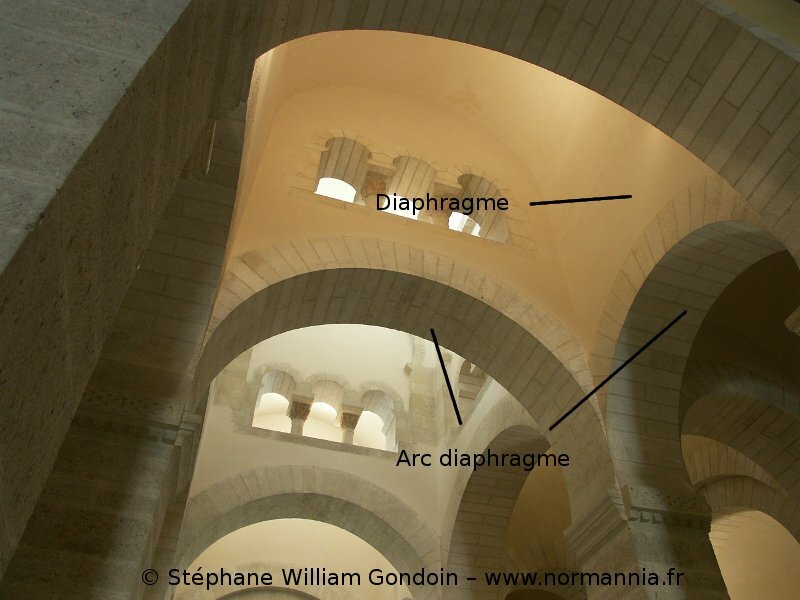 The picture underneath shows the arcs diaphragmes (from left to right) in the Saint-Philibert in Tournus. 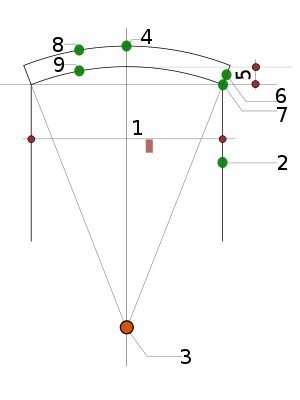 In plan (Wikipedia) the belt arches are shown in green; the red area is part of a travée (bay). 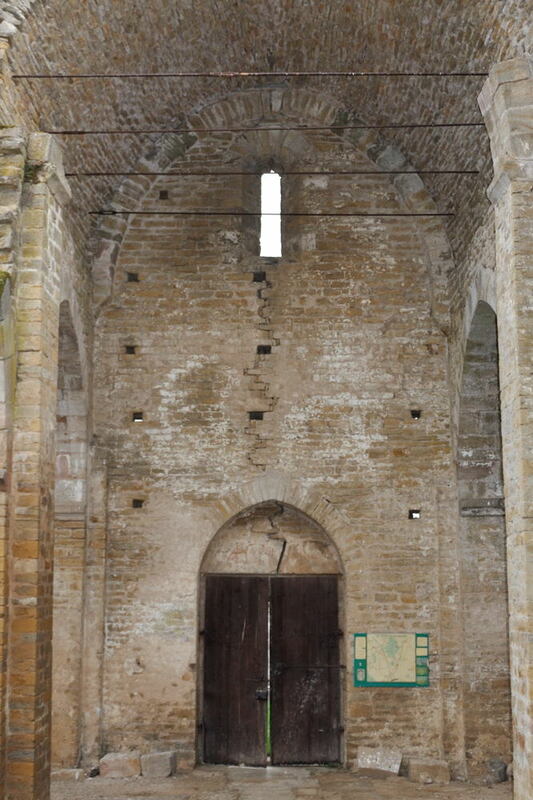 A belt arch carries the roof construction of a church. 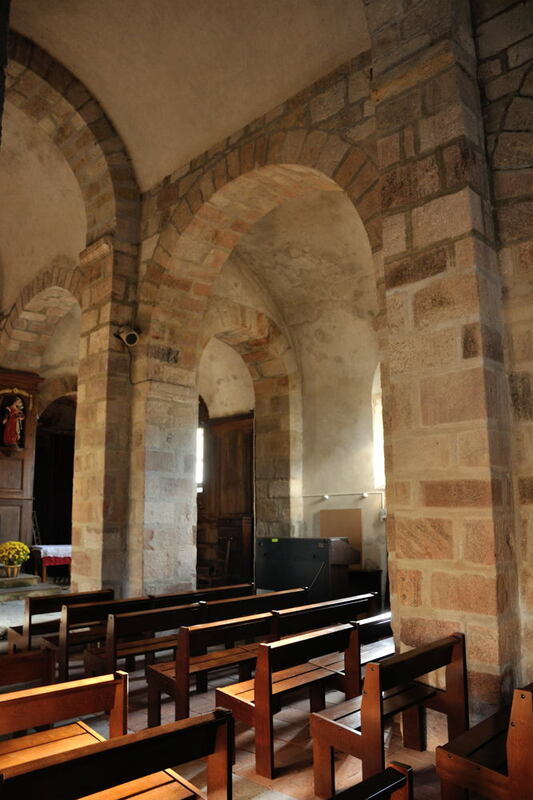 The picture shows several belt arches in the Saint-Martin in Chapaize. The arc (arch) in the foreground is strictly speaking not a belt arch; it carries also part of the coupole (cupola) under the clocher (bell tower), and hence part of the clocher as well. 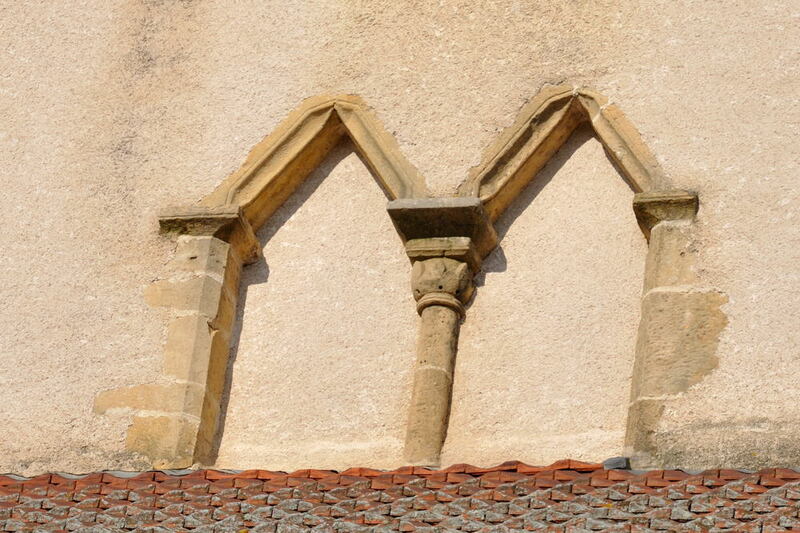 An "arc" ("arch") having the shape of a mitre. In the picture the clocher (bell tower) of the Saint-Julien in Saint-Julien-de-Civry. An arc (arch) having the shape of a semicircle. 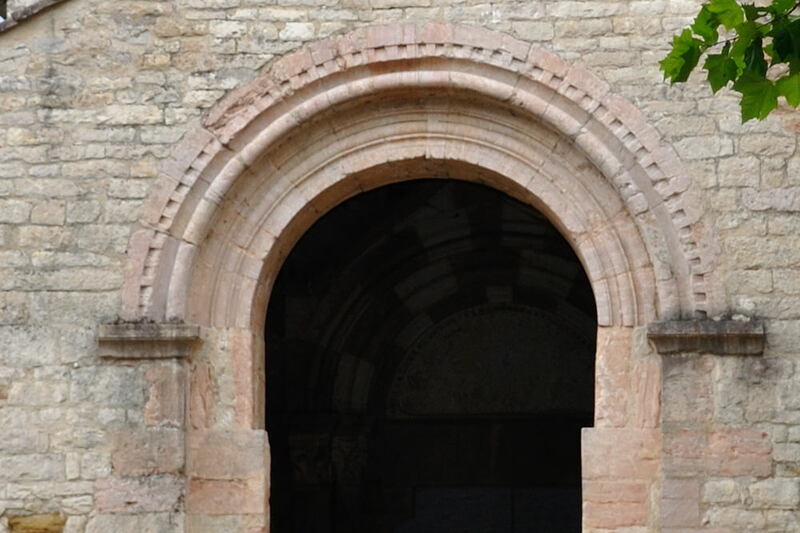 The picture shows a round arch in the Saint-Germain-d'Auxerre in Buxy. See also plein cintre and voûte en plein cintre. An arc (arch) placed there where a voûte (vault) and a load bearing wall meet each other. 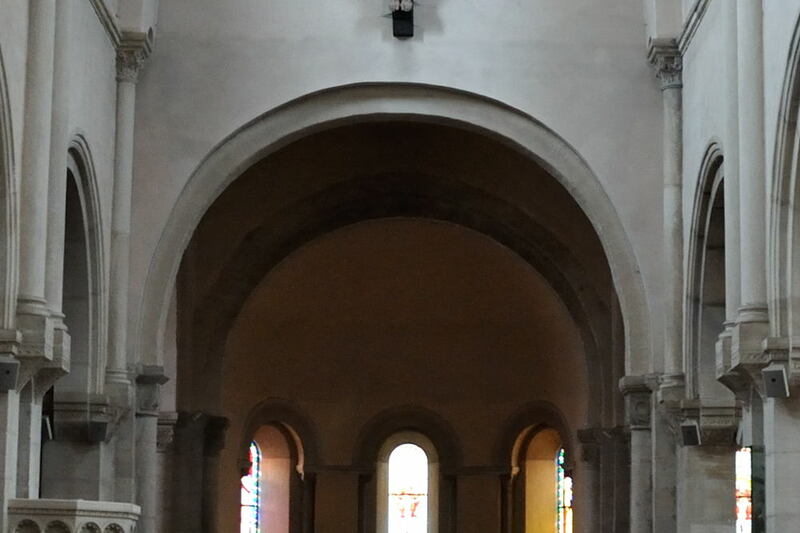 The arch in this photograph is placed there where the façade (facade) and the end of the vault covering the nef (nave) of the Saint-Christophe in Le Puley meet each other (high in the picture, above the narrow window opening). See also arc brisé (synonym), lancette, tiers-point, ogive, voûte d'ogives and croisée d'ogives. 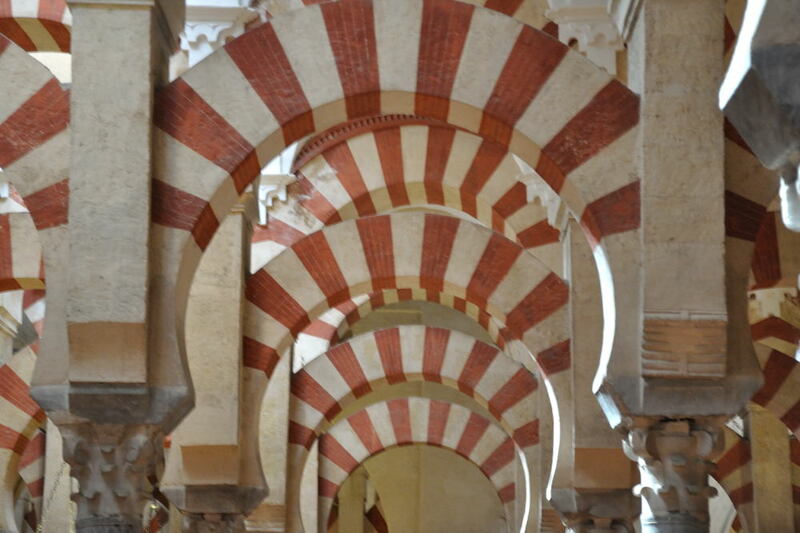 These arcs (arches) are very popular in Moorish architecture, as can be seen in this picture made in the Mezquita in Córdoba. A less exuberant example can be found in the Saint-Donat in Saint-Point. 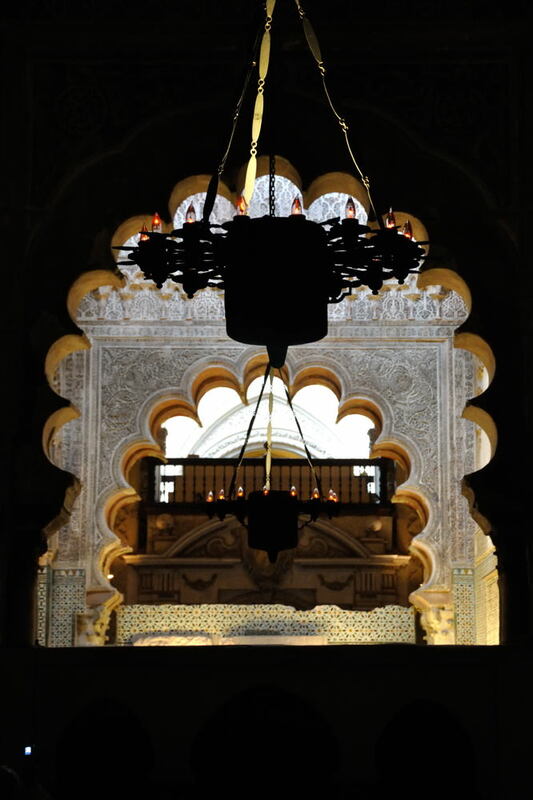 These arcs (arches) are quite common in Moorish architecture, as can be seen in this picture, made in the Mezquita in Córdoba. 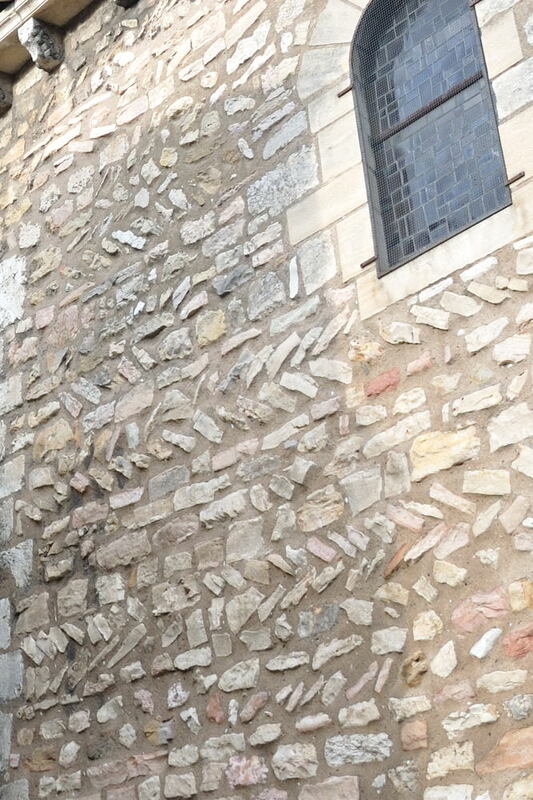 A less intricate form has been used in Cluny in the wall of 2 Place Notre Dame. The arch in this picture is an arc trilobé (trefoil arch); there are also varieties called arcs quintilobé (with 5 foils), etc. As can be seen in the picture, the ends of the semicircle are extended over a short distance downwards with a straight line. In the picture one of the entrances of the Sainte-Marie-Madeleine in Le Villars. One should not confuse this type of arc (arch) with the Roman triumphal arch (arc de triomphe). The arc triomphal marks the beginning of the chœur (choir). An arcade is the total of an arc (arch) and its supporting colonnes (columns). In general arcades are big and constructive. 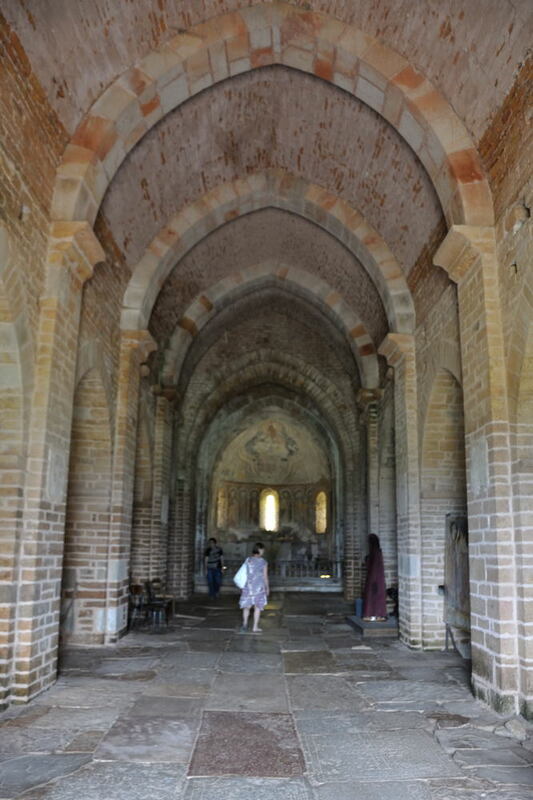 These arcades can be found in the nef (nave) of the Saint-Ferréol in Curgy.